TORONTO — The gang at Betty’s are going to raise a glass to Bill Reddall Monday afternoon. 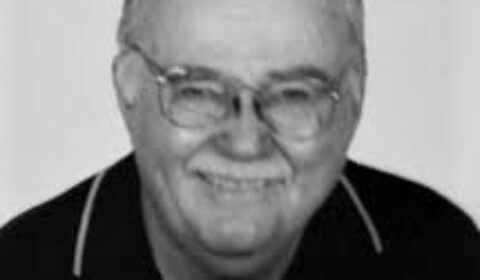 Bill Reddall, a former GHS history teacher and Indians hockey coach, died March 19, 2019, in his 84th year. And it won’t be any old toast to a friend at the Queen St. watering holy. It will follow a morning Funeral Mass for the former St. Mike’s College student, priest and teacher at the Catholic school. No, their heavenly gesture will be directed at a photo hung above Reddall’s regular pew in the front window of the pub that shows Reddall reaching out to shake the hand of the Pope. The photo reminds you of The Creation of Adam, Michelangelo’s Sistine Chapel painting of God giving life to Adam — their hands reaching out to each other. Reddall, a former Gravenhurst High School history teacher and coach of the Indians Jr. C. hockey club, died on Tuesday, March 19. He was 83, last Saturday. He leaves his wife, Judy; and a son and daughter Amy, of Portland, Ont., and David, of Edmonton, from a previous marriage to Jane Carghill. His body has been donated to the medical school at University of Toronto. Reddall was a native of Toronto and happy to retire to his hometown, where he grew up and attended St. Mike’s, playing hockey with Dave Keon and Frank Mahavolich. Father Bill Reddall reaches out to shake hands with Pope Paul VI. In recent years, after going through prostate cancer, knee replacements, getting a pacemaker and moving to a retirement home in 2014, he succumbed to Lewy body dementia. His wife said she’s happy he wasn’t aware of the scandal surrounding his beloved alma mater. “It would have killed him,” she said. Reddall left the priesthood in the fallout from the Second Vatican Council. He taught a year at Geraldton in north-western Ontario, before moving to GHS in 1974. John Brownlee was principal and hired him to teach history. At a time when most new teachers were young grads, Reddall stood out as like a seasoned professor and mature man. He remained friends with many students after retiring from teaching in the late 1990s. Former student David Christensen, who also played for him with the Indians, said: “He was one of the most important people in my life. “He changed the way I was going in hockey and school. I’m one of his biggest fans. Bill Reddall turned the Gravenhurst Indians Jr. C hockey team in to winners in the late 1970s and early ’80s with his championships background at St. Mike’s. Hal Humphries, of Gravenhurst, a friend and colleague, hit it off with Reddall when they came to town and through a love for teaching, coaching and hockey. “Bill and I arrived at GHS the same year — 1974 — my first year teaching. And we lived side by side at the Pinedale Apartments, owned Arne Nielsen. “We also soon discovered that we were to teach side-by-side at GHS as well — Rooms 115 and 116,” said Humphries in an email. “Bill and I shared academic interests as well. He with his MA in history and me a new geography grad. He was a great resource for a young rookie teacher. “Bill had taught many years earlier at St Mike’s as well as at Mt. Royal College in Calgary, before his stint in Ontario’s far north at Geraldton. The two also bonded over their mutual love for hockey. “I also found out when I met Bill in that fall of 1974 that we shared an interest in hockey. After a number of chats about hockey, I quickly discovered the breadth and depth of Bill’s background, compared to mine. “I could boast some Jr. B experience in St Marys with the Lincolns and some minor hockey experience. “But Bills background was associated with the Toronto Maple Leafs farm system at St Mike’s in the 1960. Humphries said Reddall told him he was the assistant coach on the 1960-61 Buzzers team that won the Ontario provincial title (undefeated in playoffs). That was the same year that the St Mike’s Majors won the Memorial Cup coached by Father David Bauer. Hal the players on that team played in the NHL or other pro leagues. Reddall said goalies Gerry Cheevers and Gary Smith were on his teams. This was the time when the Leafs owned the players at St Mike’s and on the Marlies who they were developing for the Leafs team. “Pretty impressive hockey involvement, I thought,” said Humphries. Reddall’s background “got out” and very quickly and he was “hired” to be the head coach of Gravenhurst Minor Hockey that fall of ’74. ‘Head coaches’ for minor hockey associations was a popular model in the Muskoka. Parry Sound had former Leaf great Bucko McDonald, who came from Sundridge. Reddall resurfaced in 1978-79 to be the first coach of the Indians. Humphries, who was his assistant coach, said and the St. Mike’s connection proved useful. “Steve played here for a number of years and earned his diploma from GHS. Bernie Bowins, the team’s GM, was another close friend. He and Reddall and fellow teachers Gerry Bray and Terry Vint were partners in a cabin cruiser. But, as they say, there’s no ship rougher than a partnership. All are gone now. Humphries concluded that Reddall “was a fine, accomplished teacher in the traditional mould. Proud alumnus of St. Michael’s College School. Class of 1957, University of Toronto. Loving husband and best friend to wife Judy. Survived by son David, daughter Amy and grandchildren Nora and Stella. Memorial service to be observed at St. Paul’s Basilica, 83 Power St., Toronto, on Monday, March 25, 2019 at 11 a.m.
A reception to follow at Betty’s, 240 King St. E., Toronto. In lieu of flowers, donations would be welcome at Castleview Wychwood Towers, 351 Christie Street, 4th Floor C, Toronto. Coach Bill Reddall, second from the left in the front row, is seen with the first Gravenhurst Indians Jr. C in 1878-79. Hal Humphries is second from right. A great tribute this eulogy, Mark, to our very fine Bill Reddall. Sympathy and love to Judy. My condolences to the family — Mr Reddall was a bright spot at GHS. My condolences to Amy, David and the entire Family. Bill was the best history teacher ever!